for one more glimpse of a loved one? In Future Love, Edward Hoornaert’s collection of science fiction short stories, we meet alien animals called Cuddlies that can let you glimpse your loved ones — even after their death. In the story Love and Death in a Teriyaki Forest, Pericles Harris pursues his beloved beyond death … but finds only the evil in his own heart. Inspired by NASA’s fanciful travel posters for other worlds, I have designed travel posters for some of my science fiction worlds. I enjoy doing graphics work from time to time; it’s a great change from a word processor. 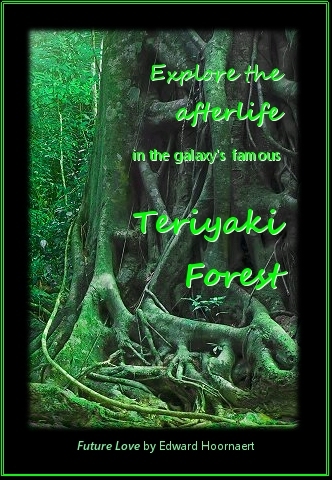 Today for the first time, here is a travel poster for Future Love, featuring that seductive teriyaki forest. See more travel posters for my worlds of fiction. Have you every thought about promoting travel to your worlds by creating a poster? Tell us about it in the comments. If you crave stories that deal honestly with love’s potential for heartbreak and redemption, you’ll adore Future Love. Seize tomorrow today – pre-order Future Love.